Two of the bloggers who participated in the meme yesterday were from Philadelphia and my guest blogger Iron Cook Carl is from Willow Grove which is just outside of Philadelphia. With his help I was able to put this post together to at least begin my month of food related posts. I was inspired to post my recipe for a Philly Cheesesteak and see what you think about it. If you have never had an authentic cheesesteak I’m going to ask you to never get one. What you talkin’ bout Willis? Let me explain. Authentic Philadelphia Cheesesteaks use Cheez Whiz. Personally Cheez Whiz belongs on a cheesesteak the same way vomit belongs on your cereal. It’s culinary sacrilege. 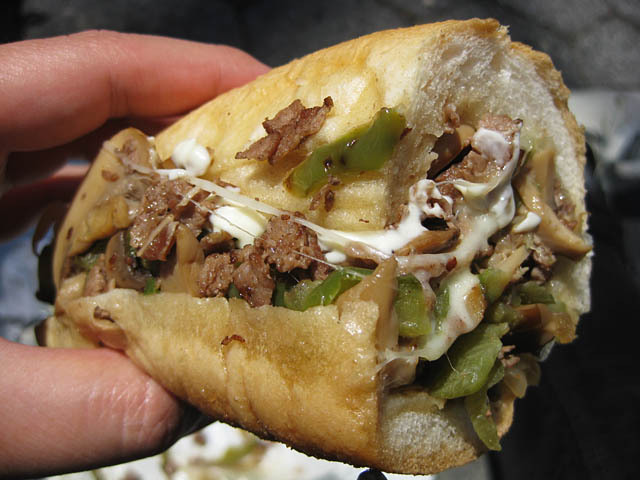 There are many variations to the cheesesteak as far as what kind of cheese to use: mozzarella, provolone or white American. Whether or not you want sautéed onions, hot peppers, mushrooms, banana peppers, bell peppers, salt and pepper, or with the addition of shredded lettuce and tomatoes, the all powerful cheesesteak hoagie! Ketchup and mayonnaise are also optional but if you put mayonnaise on a cheesesteak don’t think about sitting at the same table with me. You have to eat somewhere else. I do feel that strongly bout it! So you know Cheez Whiz is out! The one constant in a Philly Cheesesteak is the bread. True cheesesteak aficionados only use Amoroso long rolls to make their sandwiches. When making a cheesesteak do not use Steak-Ums. Get a butcher to cut thinly sliced rib-eye or top round for you. It is easier to purchase the roast, freeze it and bring it back to the butcher to get it sliced as thin as humanly possible. It is quite possible that if you try to make a cheesesteak with Cheez Whiz crap that you might like it. For that reason you should try to make it with either provolone, mozzarella or white American cheese first. Then after that, you won’t like it with Cheez Whiz. I guarantee! Wanna make one? Or better yet, let me make it for you. Sauté onions on low flame until translucent in fry pan. Remove the onions and turn heat up to medium. Cook the meat until brown and add seasoning to taste. Add onions back into pan and separate contents into two piles. Place the cheese on top of the piles of onions and meat to melt. Cover with open rolls. When cheese is melted use spatula to fold meat and onions into roll. Serve with pickle, French fries and ketchup. Mmm mmm great! On a side note: some bloggers from yesterday’s meme are under the impression they can only visit blogs that they have never visited or commented on before. Not so. As long as you do visit the sites you don’t normally or have never visited, you can also visit and comment on all the other blogs that participated as well. Also another blogger who had difficulties with scheduling has her meme answers posted; visit Disjointed Rhymings to read and comment. You are currently browsing the archives for the Philly Cheesesteak category.